India, the traditional power in the region, is muscling into port and other projects in Sri Lanka, pushing back hard against China. Gleaming cranes stretch out on the waterfront in the Sri Lankan capital Colombo as Chinese companies construct a $1.5 billion new commercial district, including hotels, marinas and a motor racing track. They have already built a giant container terminal nearby and a huge port in the south. Now India, the traditional power in the region, is muscling into port and other projects, pushing back hard against China. The big fear for India is that Sri Lanka, just off its southern coast and on one of the world's busiest shipping routes, could become a Chinese military outpost. But the battle is creating political turmoil in Sri Lanka. A bust-up between President Maithripala Sirisena and Prime Minister Ranil Wickremesinghe over how far to accommodate Indian interests is a key reason the nation's unity government has just fallen apart, government officials and foreign diplomats said. Wickremesinghe, who was fired on Oct. 26 and replaced by veteran pro-China politician Mahinda Rajapaksa, told Reuters about arguments at a cabinet meeting chaired by the president last month over a proposal to grant development of a Colombo port project to a Japan-India joint venture. "There are arguments in the cabinet, sometimes heated arguments," he said. Wickremesinghe did not name the president but said: "There was a paper put forth to not give it to India, Japan." He added that he insisted that the ultimate decision should respect a memorandum of understanding signed between India, Japan and Sri Lanka. It was the first account of what transpired in the Oct 16 meeting and the government's pushback against India. Wickremesinghe declined to respond when asked if he believed the China-India struggle was behind his firing. But Rajitha Senaratne, a former government minister who attended, confirmed the president and the prime minister had argued at the meeting. Two Sri Lankan officials, as well as a Western diplomat and an Indian government source, who were all briefed on the meeting, corroborated the minister's account. The president's office did not respond to requests for comment. Sirisena told a public meeting on Monday his political rivals were trying to drive a wedge between him and the Indian government by painting him as anti-India. The foreign ministry said the centre was committed to giving developmental assistance to Sri Lanka. In a statement last week, the Chinese embassy in Colombo rejected allegations China was involved in a conspiracy to change Sri Lanka's leadership, saying it does not believe in such interference. Japan did not respond to a request for comment on the sacking of the government. But Wickremesinghe and an official from the Japan International Cooperation Agency said a $1.4 billion soft loan for a light railway project in Colombo was on hold. India had been pushing Sri Lanka for the award of an estimated $1 billion contract for a second foreign-operated container terminal in Colombo. It has pointed to a memorandum of understanding (MOU) Sri Lanka signed in April 2017. Reuters has reviewed unpublished documents from that MOU and it lays out a blueprint for projects India would be involved in, including an oil refinery, roads, power stations and the container terminal. The agreement also includes room for Indian involvement in the development of industrial zones. 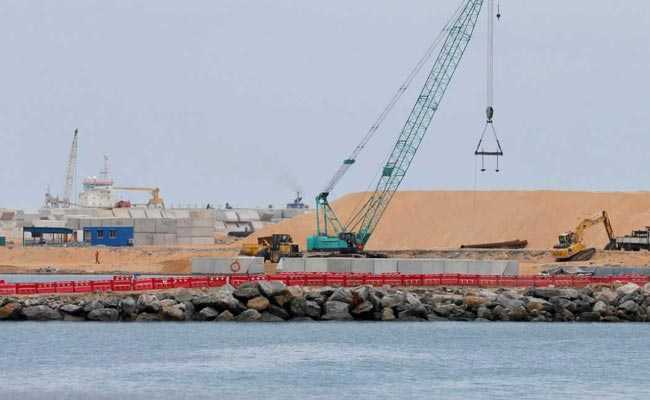 The cabinet meeting was supposed to give clearance for the port project but President Sirisena said the country, already mired in $8 billion of Chinese debt, couldn't give any more of its assets to foreigners, according to Senaratne. "There was a misunderstanding between the president and the prime minister," said Senaratne, who was the health minister in the deposed cabinet. The Colombo terminal should be left to the state-owned Sri Lanka Port Authority, which was already developing the facilities, he quoted the president as saying. Tension had been building between Sirisena and Wickremesinghe even before the clash over the port project. The president did not approve of some economic reforms, such as opening up the services sector to foreign investment, being introduced by the prime minister. Sri Lanka is only one of a number of South Asian countries where the China-India rivalry has roiled domestic politics. China has been constructing ports, power stations and highways in Pakistan, Bangladesh, Sri Lanka, the Maldives and Nepal, much of it now tied to its ambitious Belt and Road Initiative to connect China with countries cross Asia and beyond. In September, the leader of the Maldives - who had courted Chinese investments - lost an election in a result seen as a setback to Beijing's ambitions for the islands. One of the officials briefed on the cabinet meeting said he was told Sirisena quoted U.S. Vice President Mike Pence's warning last month that China was using "debt diplomacy" and the Hambantota port in the south could become a Chinese forward military base. Sirisena told the cabinet Sri Lanka didn't want this kind of international attention and vowed he wasn't going to compound the problem by granting the Colombo deal to an outside party, this official said. But Wickremesinghe, who has forged close ties with India and Japan to balance ties with China, said at the meeting that the cabinet had already approved the broader pact with India a year ago, he told Reuters. He said the debt-burdened Sri Lanka Port Authority wasn't in a position to build the terminal on its own, Wickremesinghe said he told the meeting. "It wasn't even an Indian project, Japan was going to be the majority partner with India at 20 percent," Wickremesinghe said in the interview. But the president not only rejected the proposal but shocked those present by turning on New Delhi, saying he was the target of an assassination plot and suggesting that the Research and Analysis Wing (RAW), was behind it, said officials who attended the meeting. The Sri Lankan government later denied Sirisena named the agency. The foreign ministry in New Delhi said Sirisena spoke to Prime Minister Narendra Modi about the issue to ensure it didn't lead to a diplomatic crisis. But ten days after the cabinet meeting, Wickremesinghe was out and former president Rajapaksa was named in his place. Rajapaksa had ushered in Chinese investment when he was president from 2005-2015 and lost a presidential election to Sirisena after reports that RAW had helped build a coalition against him. In Colombo, the increasing Chinese influence is there for all to see. On the city's ocean front, a part of the ocean is blocked from view because of the reclamation project that will eventually turn into the new commercial district. Giant billboards and wire mesh, including some signs in Chinese, close off the largest construction site in the capital. There is a growing Chinese community of about 12,000 expatriates, up from barely a few hundred a few years ago. They are scattered in Colombo and Hambantota. PM Modi's government is determined to start to turn back the tide. It is aggressively pitching for projects next to Chinese investments, so China's military does not get a free pass. "India can ill afford to ignore the strategic advantage China has gained in Sri Lanka so close to peninsular India," said Colonel R. Hariharan, a retired Indian army intelligence officer. The Colombo port isn't the only priority. In Hambantota, India is bidding to take control of an airport built next to the Chinese seaport even though it handles hardly any flights. "We are fully in the game," said an Indian government source. It kept its profile low, though, because of local sensitivities, the source said.